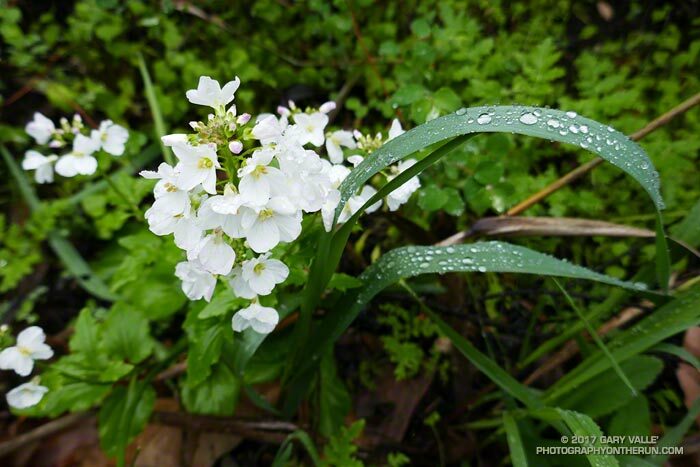 Milkmaids (Cardamine californica) are among the first flowers to bloom in the Santa Monica Mountains in the early Winter. The plant prefers the the coast live oak understory, and the four-petaled white blossoms stand out brightly in the shade of the trees. These are along the Serrano Canyon Trail in Pt. Mugu State Park. This photo was taken February 4, 2017, but milkmaids were blooming on this trail as early as January 1, 2017.